Our range of Hamilton compatible tips work reliably with the MICROLAB® STAR and NIMBUS automated workstations, which utilise the CORE (Compressed O-Ring Expansion) attachment system. Choose from 10µl, 50µl, 300µl & 1,000µl volumes, filtered or non-filtered, in nested stacks of 5 or as individual blister-5 packs. Sterile racks are also available. 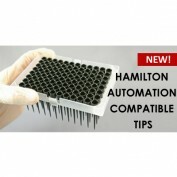 Click here to see our full range of Hamilton Compatible Tips. For samples or to speak with one of our experiences sales representatives, call us on 01256 811118 or email at [email protected].